Three keynote speakers kicked off the event: Drs Eden Wells (link), Hamid Ghanbari (link) and Mark Wilson (link). Teams tackled global problems such as refugee health as well as local problems like the Dioxane plume threatening Ann Arbor ground water and made valuable connections with their peers as well as our over 40 mentors. Saturday morning, 91 participants pitched and listened to a range of problem areas in preventive healthcare today. After mingling, participants formed 21 teams focused on developing a particular solution to these problems. These teams worked through the night (we needed a second order of midnight pizza) and presented on Sunday where we announced our winners. Winner: Disease Detectives – a kid-friendly mobile app enabling kids to be self-report respiratory disease symptoms in research studies. Winner: VHabilitate – a Virtual Reality App for Eye Movement Desensitization and Reprocessing (EMDR) to help patients suffering from Post-Traumatic Stress Disorder (PTSD). Third prize: Company Incubation at Ann Arbor SPARK (link) and a $300 cash prize. Winner: Q- Personalized PT Assistant – a personalized real-time motion capture application to improve quality and adherence or physical therapy. Winner: Improving Cardiovascular Disease Prevention – An easy-to-understand, paper-based test to signal onset of atherosclerosis (think current pregnancy tests). Winner: CarT – connecting transportation and grocery stores to increase access to nutritious food (think Uber to Meijer). As organizers, the most exciting and encouraging part of these event was what happened after. Even a few of the teams that didn’t win prizes went on to continue their projects. For example, Team Nursing 911, continued building a platform for instant nursing advice and connection. They are planning on continuing this work along with the team working on genome sequencing data applications. 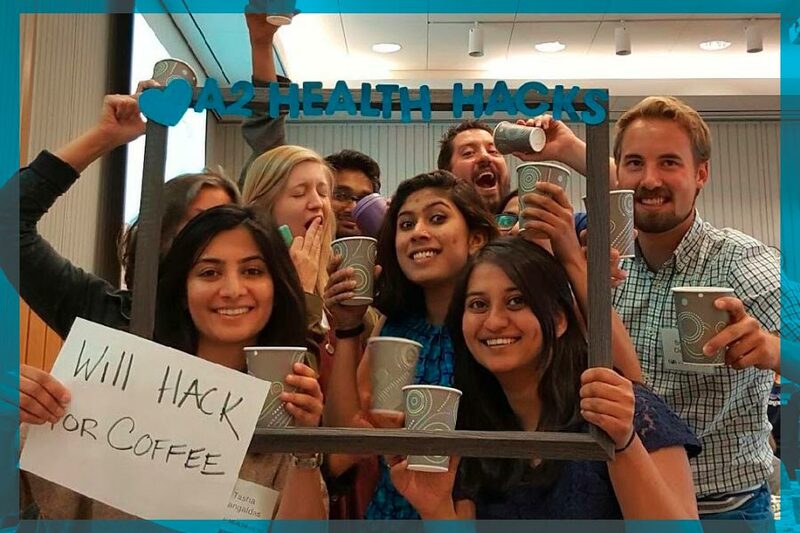 The four of us started Ann Arbor Health Hacks (A2H2) in late September 2015 with the goal to foster medical innovation and spawn new healthcare startups in SE Michigan. We plan on accomplishing this through organizing regular healthcare hackathons to bring together the IT, tech and healthcare community. Support from that community including 19 volunteers, 12 sponsors and of course participants and mentors made this first event a success! If you’d like to learn more about how you could get involved, sign up to be part of our email newsletter here!